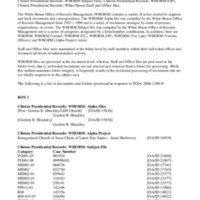 This collection consists of records related to President Clinton and his interactions with the Church of Jesus Christ of Latter Day Saints, or Mormons, as well as visits by President Clinton to Salt Lake City, Utah. This collection consists of correspondence, memoranda, itineraries, schedules, and press clippings. The records describe President Clinton's interactions and communications with different leaders of the Church of Latter Day Saints and various Latter Day Saints organizations. They also deal with efforts by President Clinton and administration officials on behalf of Salt Lake City’s bid to host the 2002 Winter Olympic Games, and some of the planning that took place for the Games.